What a cute little pumpkin Gracie was on wednesday night. She did really well with the costume but couldn't have cared less about all the candy. Hey this will be the only year so we will take it. Thanks to Tom, Lauren and Maddie for having us all over to trick or treat and celebrate the holiday together. We had a blast with Cinderella. My best friend Jen and I have this weird brain connection thing. Once again, without consulting each other at all we buy the same type of costume for both girls first Halloween. Who would have guessed it? Madison and Gracie sure were the cutest pumpkins in the patch though. This pic was taken right before Gracie leaned in to smooch Madison, not typical of our little brute but very welcomed. Hope your Halloween is spooktacular! Hahaha! Gracie had her doctors appt today. What a trip, she is off the charts for her weight and her height is 99th percentile. She may need baby slim fast sometime but for now she is very well proportioned and she will be a big girl. Tall and solid! She weighs 24 lbs 4oz and is 31 inches tall. Crazy! On another happy note, Marley is officially a Hosford. He is full of beans and super sweet. He loves Gracie but sometimes thinks she is another puppy when she crawls and he wants to play. He obeys pretty well for a puppy but we are working on training him better. He is house trained, sleeps well and is also crate trained. Over all a very good dog and we love him to bits. Stay tuned for much more about him and Gracie both as they grow up together. Loves! Gracie's first pumpkin carving. She was wondering what the heck the big orange thing was. She was not sure this was going to be as fun as we said it was. Check her getting her pout on. This part was much more exciting. Squishy seeds and slimy stuff. Look at dad go with that knife. Yum!Yum!Yum! She loved the squish factor of all the middle stuff. She even thought it tasted good. What a nut! The final product. How cute is that? Gracie was so proud of her G pumpkin, she really just wanted to touch the candle inside. Oh well, what do you do! Gracie took mommy and daddy to the park yesterday. What a blast we had. Went down the slide, played on the swings and crawled in the sand. Now that's a fun time had by all. There were a few other kids at the park and Gracie was totally jealous that they could run and play. Don't worry girlie, you are not far behind them! We will be welcoming this beautiful toddler boy into our family on Tuesday of next week. 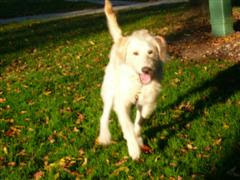 His name is Marley and he is a 15 month old Labradoodle. He is super sweet and full of energy. He LOVES people and being outside. We will be recueing him from a family in Lansing, MI. We are very excited to have another dog in our family. We have searched for over a year now. Gracie and Marley will grow up together and we are just thrilled. He is very fond of Gracie and she gets super excited and giggly when he is here. We are sure that this will be lots of work to begin with because Marley is very smart so he will need training or else he will be naughty. We would love for you to meet him so stop on over and check him out in a few weeks. I can't beleive our baby girl isn't a baby anymore. She is totally a toddler now. She still prefers crawling because she has mastered that skill and it gets her hwere she needs to go. She does love to stand up now though and she also likes to CLIMB on everything possible. We have our hands full but we are loving every minute of it. With that gorgeous smile how could you not? We have her docotrs appt next Wed and we are curious to see how much she weighs and how tall she is. Her feet are huge, almost size 5! Gracie loves to play outside. We often go to the park down the road so she can fell the sand and now the crunchy leaves are just too much fun. Fall is by far our favorite season and we hope Gracie loves it too. So far so good. Looking forward to the Harvest party weekend in Gaylord! See you at the Catts! Our little sassy britches has decided to be even more independent these days. Here she is in the full throws of a giggle fit while playing with mommy. Her new position for watching her favorite show, Tigger and Pooh. She's like her mommy and Winnie the Pooh is her favorite cartoon character. It's the only thing on TV that will hold her attention for more than 2 minutes. Ha! Here she shows off her moves on her feet. This is her push walker and Tuesday she pushed it around the house and ran into the bookshelf in the living room, she turned to find me so I could get it unstuck for her and I had a toy in my hand. I put the toy on the ottoman and stood up. She then decided she wanted the toy and took her first (5) steps to get it. I was so excited and she had no idea what she did. I clapped for her and she got excited and proceeded to dance. Oh the joys of parenting. Gracie searches for her ball. "I swear it was here a minute ago"! I will keep you all posted on her new moves nd her walking skills as they improve. I really didn't think I'd have a walker on my hands at 9 months old... shows what I know huh. She decides to go overboard. Nice catch mom.. Our sweet pea has absolutely no fear. We will have to watch this girl like hawk. Fun Fall saturday at Robinette's Orchard. Dan and Gracie in line for warm cinnamon/sugar donuts. Gracie trying to push that darn apple over. Go Gracie go! Our little climber playing with daddy. Woah, all these apples and a fresh cold cider to go. We had warm cider there and nothing compares to Robinettes cider. you can't beat it. She's getting SOOO big. I think she may be 6 foot tall by kindergarten, I don't know. She is growing so fast and we can't keep up, so please no teasing when she wears her highwater pants. Thanks! Loves to all and have a happy fall. October 8, 2007 Laney Rose Carlson. Born at 3:35pm. Weighing in at 7lbs 3oz and 20 in long. She is the sweetest little peanut. Cute as a button and has LOTS of beautiful dark blonde hair. She has a strong. loud cry and was quite awake for us crazy family to meet her. Kelli and Laney will be in the hospital until at least Thursday if you would like to visit. She has a big room with a great view on 5 center. Look at those eyes, wide open to see what all the fuss is about. Kisses from a proud big brother. Safe and sound in mommy's arms. Getting a check up and protesting loudly about it. Holy Cow, What a week!